Of all the numbers posted at Wednesday’s Reindeer Games, only one really mattered to Polk County assistant track coach Amanda Simoncic. 3,000. The number of cans of food that the annual holiday-themed indoor track meet produced Wednesday for Thermal Belt Outreach Ministry. Helping feed the hungry in Polk County is one reason Simoncic suggested some nine years ago the idea that has evolved into the Reindeer Games. 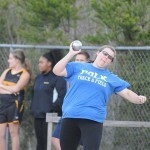 Sixteen girls teams and 18 boys teams competed Wednesday in the 7th annual Games, with T.C. Roberson winning the girls meet and A.C. Reynolds taking the boys title. 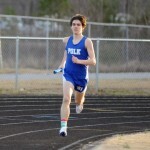 Polk County placed second in the girls meet and third in the boys. But the Wolverines won the one competition they most wanted to win, donating more than 1,800 cans to win the team competition. As of meet’s end, more than 2,700 cans of food had been donated, with $400 in donations adding up to another 400 cans. Thermal Belt Outreach will use that food in programs such as its Feed-A-Kid program, which sends backpacks full of food home with local children. “(Thermal Belt Outreach director George Alley) told me that there are 220 kids in the backpack program,” Simoncic said. “That’s mind blowing to me. With over 3,000 cans, we’ll reach a lot of them. Similar sentiment was shared by Polk County head coach Alan Peoples, who dressed the part of Santa Claus throughout the meet. “We had a good running day, we had a great day raising food and everybody seemed to have a good time. It was fantastic,” Peoples said. A day of fun and festivities with a purpose – it’s perhaps more than Simoncic ever expected when she first proposed the school hold a Christmas meet. “This means the idea that I had that I didn’t know if it would grow has grown,” Simoncic said. “The idea has become contagious. The kids are the one doing this now. 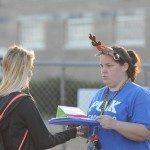 Polk County assistant track and field coach Amanda Simoncic, right, proposed the idea for the annual Reindeer Games nine years ago.